The Global Volcanism Program has no activity reports for Fonuafo'ou. The Global Volcanism Program has no Weekly Reports available for Fonuafo'ou. The Global Volcanism Program has no Bulletin Reports available for Fonuafo'ou. The ephemeral Fonuafo'ou island in the central part of the Tonga Islands is also known as Falcon Island, named after the British vessel H.M.S. Falcon which reported a shoal in 1865. This volcano has been the site of island-forming eruptions on at least two occasions since the 19th century. 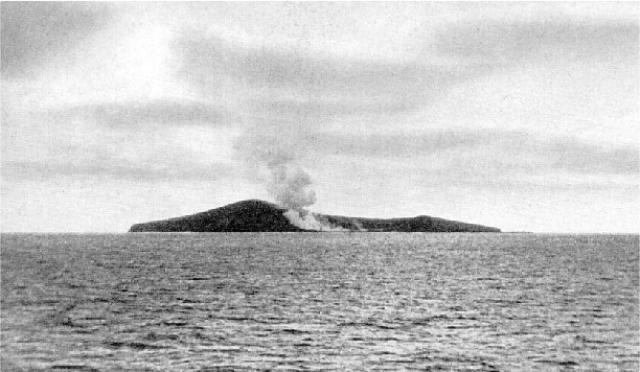 Islands up to 6 km in length were formed in eruptions beginning in 1885 and 1927; in 1933 the island had a height of more than 145 m. Passing ships often reported "smoke" issuing from the site. The latest explosive eruptions were reported in 1936. By 1949 the island had eroded beneath sea level, but the summit remains at shallow depths. Hoffmeister J E, Ladd H S, Alling H L, 1929. Falcon Island. Amer J Sci, 18: 461-471. There is no Deformation History data available for Fonuafo'ou. There is no Emissions History data available for Fonuafo'ou. Falcon Island is seen from the SE showing the active crater through the SE breach; a steam column is dispersed to the NW by dominant SE Trade Winds. The ephemeral Falcon Island in the central part of the Tonga Islands was named after the British vessel H.M.S. Falcon, which reported a shoal in 1865. Falcon Island has been the site of island-forming eruptions on at least two occasions since the 19th century. By 1949 the island had eroded beneath sea level, but the summit of the volcano remains at shallow depths. Photo by A. Thompson (published in Taylor and Ewart, 1997). There are no samples for Fonuafo'ou in the Smithsonian's NMNH Department of Mineral Sciences Rock and Ore collection. Large Eruptions of Fonuafo'ou Information about large Quaternary eruptions (VEI >= 4) is cataloged in the Large Magnitude Explosive Volcanic Eruptions (LaMEVE) database of the Volcano Global Risk Identification and Analysis Project (VOGRIPA).